The classic comment stating that “Africans sold Africans” during the Atlantic slave trade is very common in online forums or classroom discussions. 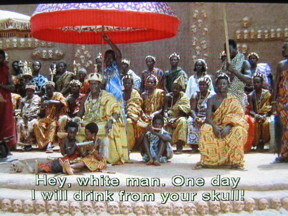 Commentators who bring this argument, in order to downplay the magnitude of the slave trade as a human atrocity, fail to understand that during the era of the Atlantic slave trade, Africans did not associate themselves with a continent but rather identified themselves with various societies, states, kingdoms, and empires, bigger or smaller, where people belonged to different lineages, spoke different languages, and had various religious beliefs. Neither in the past, nor in the present, Africa can be defined or referred to as a sort of country. Based on an academic article I published some years ago, this essay discusses the story of Adandozan, the king who ruled Dahomey (present Republic of Benin in West Africa) between 1797 and 1818. During this period, the relations between the Kingdom of Dahomey, Brazil, and Portugal were very dynamic. On the one hand, Brazil was a Portuguese colony until 1822. On the other hand, it was also the country that imported the largest number of enslaved Africans during the Atlantic slave trade (more than 5 million men, women, and children). Many African captives sent to Brazil were embarked in ports along the Bight of Benin, where the Kingdom of Dahomey was located. 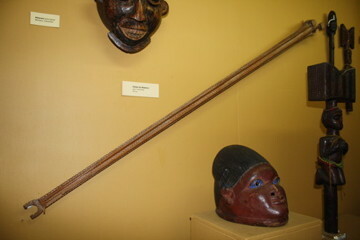 African states had close connections with Europe and the Americas during the eighteenth and nineteenth centuries. Between 1750 and 1818, the Kingdom of Dahomey sent at least five diplomatic missions to Brazil and Portugal. These missions, intended to negotiate the terms of the Atlantic slave trade, generated a large correspondence between the Dahomean kings and the Portuguese rulers. These letters are among the few known written documents allowing us to listen to the voice of the various Dahomean kings, and of King Adandozan in particular. The Portuguese and Brazilian slave merchants started settling in the port of Ouidah in 1721. In 1727, Dahomey took control of Ouidah, gaining direct access to the coast. By 1770, Portuguese and Brazilians merchants went to the Bight of Benin to sell third-rate tobacco produced in Bahia along with gold, powder, and textiles and to buy enslaved Africans. King Agonglo was made king of Dahomey in 1789, the exact year of the explosion of the French Revolution. Agonglo’s reign coincided with a period of great instability in Western Europe. France, Portugal, Spain, and England were deeply affected by the Atlantic conflicts that followed the French Revolution and led to the Napoleonic Wars. In fact, the rise of the Haitian Revolution and the abolition of slavery by the French Convention in 1794, greatly contributed to the decline of the slave trade in Ouidah. Despite the reestablishment of slavery and slave trade in 1802 by Napoleon, few French slave ships traded in Ouidah after 1794. The effects of this crisis are visible in Agonglo’s correspondence with the Portuguese rulers. In 1795, a diplomatic mission sent by Agonglo arrived in Salvador (Bahia) in Brazil. The embassy was composed of two Dahomean emissaries and one interpreter. The Dahomean ambassadors brought with them letter in which King Agonglo complained about the weight of tobacco rolls imported from Bahia. In addition, the king requested the governor of Bahia to send him other goods such as silks, carved gold, and silver. He also requested trade exclusivity: the Dahomean port of Ouidah should be the exclusive source of supply of slaves from the Bight of Benin to Brazil. He also requested the Portuguese vessels to be forbidden to trade at the neighboring ports, a proposal that would be rejected by the governor. Agonglo’s letter confirms what other historians have already demonstrated. On the one hand, products such as firearms, gunpowder, alcohol and tobacco were the main African imports during the eighteenth and the nineteenth centuries. On the other hand, the introduction of these goods, transformed Dahomean local customs and daily life. Like his father, Adandozan quickly gained the reputation of the cruelest king in Dahomean history. In 1797, when he took power, he punished all opponents who allegedly participated in the events related to his father’s assassination, sending members of the royal family into slavery, even though such measures were not at all uncommon in Dahomey when there were political struggles for power. Adandozan was depicted in the movie Cobra Verde  by Werner Herzog. As a consequence of Napoleonic Wars, the French fortress was abandoned. Then in 1807 and 1812, the Portuguese, and the English forts were respectively evacuated. By this time, the increasing importance of the port of Lagos (in present-day Nigeria) was threatening Ouidah’s predominance as the most important West African slave port. The crisis of the Atlantic slave trade is not only visible through the decline of slave exports from Ouidah by the time, but also in the various letters Adandozan exchanged with the Portuguese rulers and Brazilian officials during his reign. Under Adandozan, a new embassy was sent to Bahia. In February 1805, the two Dahomean ambassadors and one Brazilian interpreter, arrived in Bahia. In one letter brought by the ambassadors, Adandozan complains that the storekeeper of the Portuguese fort was adding water to the barrels of aguardente (a strong liquor) with which he bought Dahomey’s captives. Adandozan also denounces that the storekeeper and the new director of the Portuguese fortress were stealing and lowering the price of captives: “what is worth one ounce, he buys for one head, whereas the captives that cost thirteen ounces he pays five, and men, and women who cost eight, he pays three.” He also made a series of complaints about the Portuguese merchants who used counterfeit gold and silver in buying captives. According to him, these merchants falsified the weight of goods and also bought captives with fake pieces of silk and velvet. Such complaints could help corroborate Walter Rodney’s idea that even as consumer goods European articles sold to Africans were of the worst quality. Affected by the decline of slave exports in his port, exactly like his father did, in his latter Adandozan insists that the Portuguese should trade exclusively at Ouidah. Adandozan then draws up a list requesting several goods including powder, rifles, aguardente, silks, pipes and glass. In another letter addressed to the Prince Regent Dom João, sent with the embassy of 1805, Adandozan clearly intimidates the Portuguese ruler, by narrating how he captured the Portuguese subject Innocencio de Santa Anna. 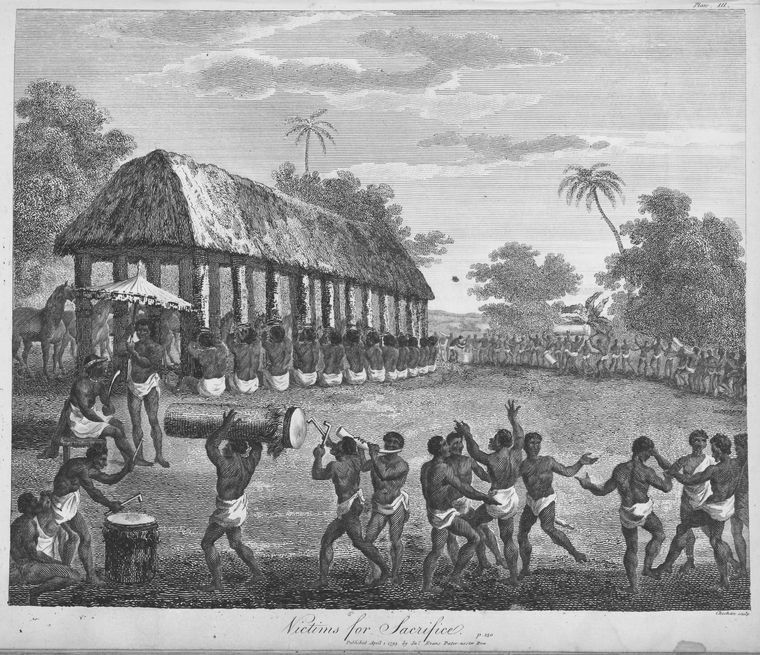 As human sacrifice was a traditional practice in Dahomey, Adandozan tells Dom João he sacrificed eleven men to report on Santa Anna’s good services to his deceased father. Victims for sacrifice, in Archibald Dalzel, The History of Dahomy: An Inland Kingdom of Africa (London, T. Spilbury and Son, London, 1793)..
After intimidating him, Adandozan expresses his wish to discuss with the prince regent the opening of Dahomean alleged “gold mines” that were “still kept secret.” The reference to gold mines was certainly a strategy to encourage Portuguese interest in Dahomean valuable natural resources such as gold, which did not really exist. Adandozan then asks the Prince Regent to give Ouidah the monopoly of the Luso-Brazilian slave trade in the Bight of Benin. Finally, he also requests the Portuguese Regent to send him someone “who knows how to manufacture pieces [of cannon], guns, powder and other things necessary to make war,” as well as 30 big hats in different colors with great plumes, as well as twenty pieces of silk. These requests suggest that Adandozan was also concerned with the imports of luxury goods such as textiles and hats, very appreciated among Dahomean elites. Several illustrations of European travelogues depict Dahomean kings wearing big colorful hats decorated with huge plumes. 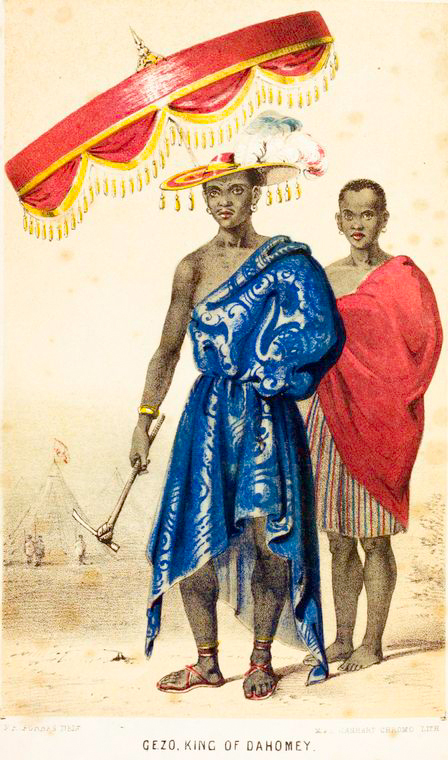 Illustration credit: King Gezo, as depicted in Forbes, Frederick E. Dahomey and the Dahomans, 1850. Source: New York Public Library, Wikimedia Commons. Britain increased its pressure on Portugal to suppress the Brazilian slave trade after the abolition of the British slave trade in 1807, and especially after 1808, when the Portuguese royal family moved to Rio de Janeiro, with the support of the British Navy, to escape the army of Napoléon Bonaparte who had decreed a continental blockade against Britain. As a result of these conflicts, between 1810 and 1826, England and Brazil signed several bilateral agreements aimed at abolishing the Brazilian slave trade. In this new context, Adandozan sent his last embassy to Brazil. The four ambassadors arrived in Bahia on January 1811 with a gift and a slave girl to offer to the Prince Regent. They returned to Dahomey only in October 1812. Since the Portuguese court had relocated to Rio de Janeiro, the ambassadors no longer needed to travel to Lisbon. But now under the British eyes, the portuguese regent no longer authorized the Dahomean ambassadors to come to the court. Soon the news that Your Royal Majesty and all the Royal family were made prisoners of the French, who took Lisbon, as well as the King of Spain, started arriving. Some time passed and another vessel came and brought other news that Your Royal Majesty and Our Sovereign Mother Queen of Portugal had left for the City of Bahia, under the protection of the English and the Portuguese Navy. Then more time passed and another vessel brought news that you have moved to Rio de Janeiro […] what I feel the most is to no longer be the neighbor of Our Majesty, and not being able to walk on firm land to give you a help with my arm, so my wish is big, as here I have also fought many wars in the backlands. In this same letter, Adandozan tells the prince regent that he was also waging war and narrates his incursions into the Mahi country and the kingdoms of Porto-Novo and Oyo, then asks Prince Dom João to give him news about the wars: “give me also news about the Wars, and also give me news about the wars with the French nation and the others, it will make me happy to know about it. […]”. Adandozan’s letter sheds light on how West Africans were following the Napoleonic Wars, because these events impacted the slave markets in the Americas and the Atlantic slave trade in West African ports. After this account, demonstrating how powerful the Dahomean army was compared to the cowardice of the Portuguese ruler and army, who were forced to escape from Napoleon, Adandozan presents his complaints and requests. Attempting to attract the Portuguese, he asks Dom João to send a governor, a priest, and a surgeon to the Portuguese fort in Ouidah. My Brother, Your Majesty as a Great Christian King, will certainly enjoy what I will ask you; I want to follow the Law of God, because this is the Law you believe. I also want to live according to it. I know the Law of God is faithful, and to accomplish this intent I want in all brevity two priests and all the Images to decorate a chapel, and as well as its ornaments, two bells for the towers and two bricklayers to build the above-mentioned chapel, because I want to please my Brother by founding a Church allowing all the whites who come to my land to know that I am your faithful brother. Perhaps the idea of building a chapel (an important symbolic mark of distinction), like the European churches, decorated with paintings and sculptures, could attract European travellers and merchants, helping to improve the relations between Dahomey and Portugal. More probably though is that Adandozan’s wish to convert to Christianity was a strategy to gain attention from the Prince Regent and have his ambassadors received at Rio de Janeiro. Also, the chapel’s story was probably an indication of how desperate he was to increase the presence of Luso-Brazilian vessels in Ouidah. There was certainly a crisis going on in Dahomey, because still in this same letter, Adandozan reported the high human mortality that was affecting his reign, provoked by sudden deaths, pain in the hips and smallpox. Apparently these events were causing many disturbances and probably provoking political instability. I send one more chair from my country, and a box to put your pipe, that is mine, and three smaller ones for the servants who accompany your Majesty. Both of them will conserve the pipes and avoid them to break. […] I also send you a flag showing the wars I waged, the people I caught, and the heads I cut, for my Brother to see and to carry in front of him when going outside for a walk. Adandozan’s throne Courtesy: Museu Nacional, Rio de Janeiro (Brazil). Photograph: Ana Lucia Araujo, 2009. 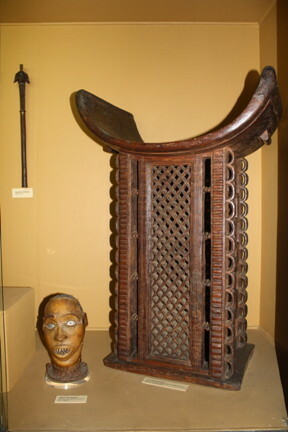 Today, the chair (or throne), the pipeholder, and the flag (image is available here) sent by Adandozan to the Prince Regent Dom João Carlos de Bragança are displayed in the National Museum in Rio de Janeiro (Brazil), attesting the exchanges between the two monarchs. Adandozan’s reign has been depicted as a period of great terror. His name was banned from Dahomey official history. Although historians do not agree on the causes of his dismissal, the decline of the Atlantic slave trade provoked by British pressures and also by the French revolutionary era played a significant role in his eventual deposition in 1818. The correspondence between Dahomey, Portugal and Brazil allow us to better understand the diplomatic, political, economic, and cultural relations connecting these three regions during the era of the Atlantic slave trade. In a period of frequent wars and instability, the descriptions of the gifts exchanged between the two monarchs show the growing importance of imported and luxury goods, indicating how much these items have shaped Dahomean daily life and how indispensable they have become. The letters also suggest that the decline of the slave trade in Ouidah and the opposition faced by Adandozan were not only a consequence of internal affairs but also the result of a larger Atlantic context in which the transformations provoked by the Napoleonic Wars were crucial. Unlike many could believe, African rulers like Adandozan were fully aware of the main major Atlantic conflicts that were evolving at the time, and approached European rulers as equals. However, the correspondence also shows how the dependency on European goods, including alcohol and firearms, contributed to perpetuate the atrocious cycle of wars to produce captives to be sold as slaves in the Americas. Akinjogbin, I.A. Dahomey and Its Neighbors. Cambridge: Cambridge University Press, 1967. Araujo, Ana Lucia. “Dahomey, Portugal, and Bahia: King Adandozan and the Atlantic Slave Trade.” Slavery and Abolition 3, no. 1 (2012): 1–19. Bay, Edna. Wives of the Leopard: Gender, Politics, and Culture in the Kingdom of Dahomey. Charlotssville, VA: University of Virginia Press, 1998. Blier, Suzanne P. African Vodun: Art, Psychology, and Power. Chicago: University of Chicago Press, 1996. Furtado, Junia Ferreira. “The Eighteenth-Century Luso-Brazilian Journey to Dahomey: West Africa Through a Scientific Lens.” Atlantic Studies 11, no. 2 (2014): 256-276. Monroe, J. Cameron. The Precolonial State in West Africa: Building Power in Dahomey. New York: Cambridge University Press, 2014. Heywood, Linda M and John K. Thornton. “Kongo and Dahomey, 1660-1815.” In Soundings in Atlantic History: Latent Structures and Intellectual Currents, 1500–1830, edited by Bernard Bailyn and Patricia L. Denault, 86-111. Cambridge, MA: Harvard University Press, 2009. Soares, Mariza de Carvalho. “Collectionism and Colonialism: The Africana Collection at Brazil’s National Museum (Rio de Janeiro) in African Heritage and Memories of Slavery in Brazil and the South Atlantic World, edited by Ana Lucia Araujo, 17-44. Amherst, NY: Cambria Press, 2015.